Be Here Now has been built from the ground up with love; we’re a piece of artwork you can enter and participate in! Enjoy a Midwestern pint in our impressive outdoor beer garden or front patio. 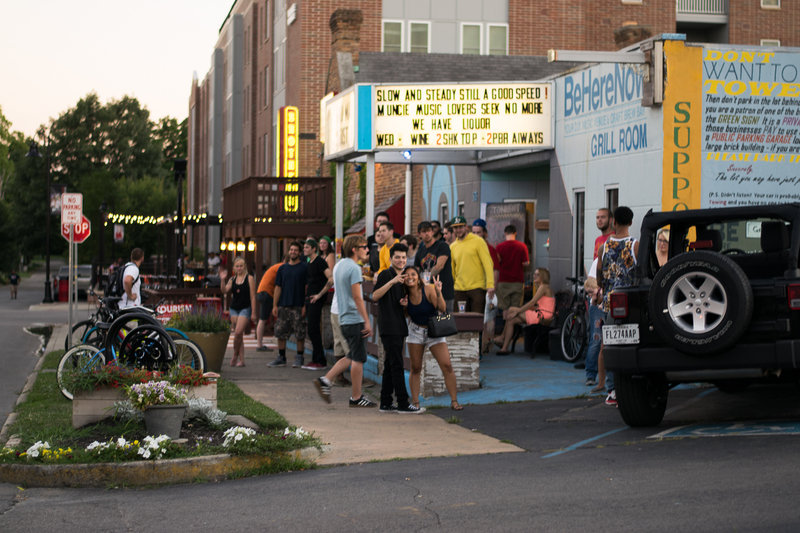 Be Here Now is trying hard to help turn around America’s Hometown of Muncie through responsible business practices and boasts a recycling program, a local business advertising wall, and serves as a stop on the “underground railroad” for both local and touring musicians! Be Here Now strives to be the change we wish to see in the world! Craft beer & liquor. We are the best of both worlds. All booking is done via email. Do NOT call the venue. Email for all inquiries and questions. This email is used for booking purposes. Read more about our booking process below. Facebook events are usually up to date so you can check availability. Send a brief bio, links to your music, etc. Including specific dates or date ranges is definitely a plus. We will NOT book cover bands or racist music. If you are in it for money then Be Here Now is likely not the place for you. We support artists; we do not hire entertainment. Please leave us a contact phone number so that we can reach you. If for any reason you need to cancel or are delayed, get in touch with us immediately (Facebook is often the best method). We will help to advertise the show. In your email, you can include flyers or any digital promotional material. Avoid putting flyers on public property around the area. 8PM would be a great time to arrive, unload, and stage gear. Please introduce yourself to the doorman and bartenders. We’re often busy but it’s good to know who our visiting guests are. You’ll receive a handstamp and some information on guest hospitality/drinks and band staging. The doorman will also likely handle any payouts at the end of the night. Please always follow the sound tech’s instructions-they are the end-all, be-all on any sound issues – Deal with it.